The Media Council of Kenya has said the New York times must pull down a horrific photo showing bodies of those killed in the Riverside attack.In a strongly worded letter on Thursday, the MCK called out the American media house over what it termed as a disrespectful, appalling and reckless publication. “The MCK vehemently disagrees with your publication’s position that the objectivity of showing gory images of dead bodies from the attack is meant to give readers a clear picture of the horror of such acts,” the statement reads. 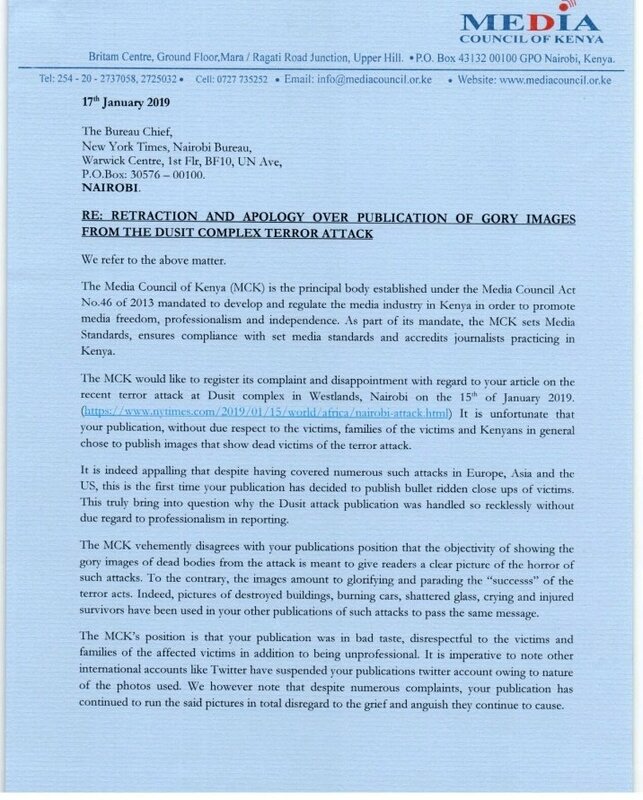 The Media Council of Kenya has also issued a 24-hour ultimatum to the New York Times to pull down the image and issue an unreserved apology, further warning that ‘relevant action’ will be taken in the event they fail to do so. 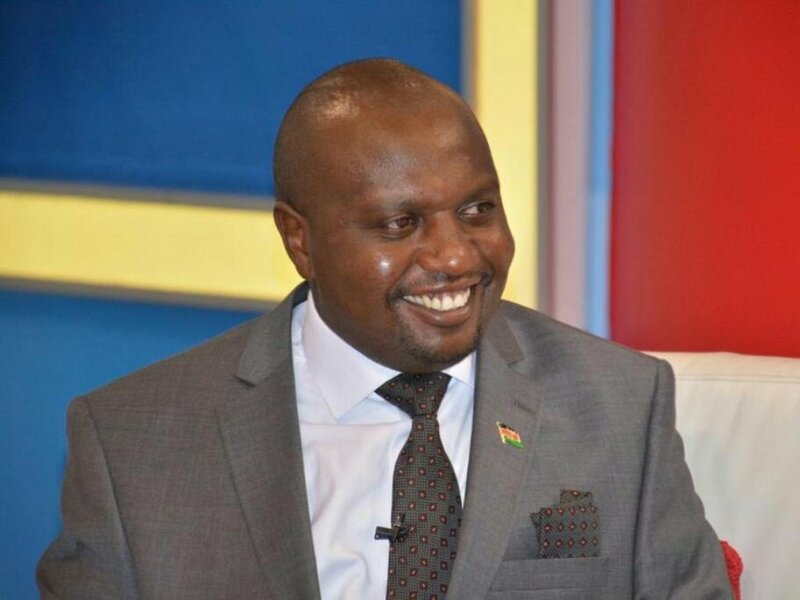 The deadline stated on the letter signed by Mr. David Omwoyo Omwoyo, the MCK Chief Executive Officer and Secretary to the Board, is January 21, 2019. MCK is the body that sets standards for journalists working in Kenya. According to the council, the New York Times was unprofessional when they published the photo as it amounts to glorifying and parading the “success” of the terror attacks. The letter dated January 17, 2019 further adds that despite calls from Kenyans and other citizens from around the world, the photo still remains on their article about the Riverside attack which is causing further anguish and grief to the affected families. This comes a day after the picture elicited a huge outcry particularly on social media platforms with calls for NYT to take down the photo. Kenyans had, on Tuesday, taken their grievances online over the media house’s insensitivity in publishing gory images on their publications. 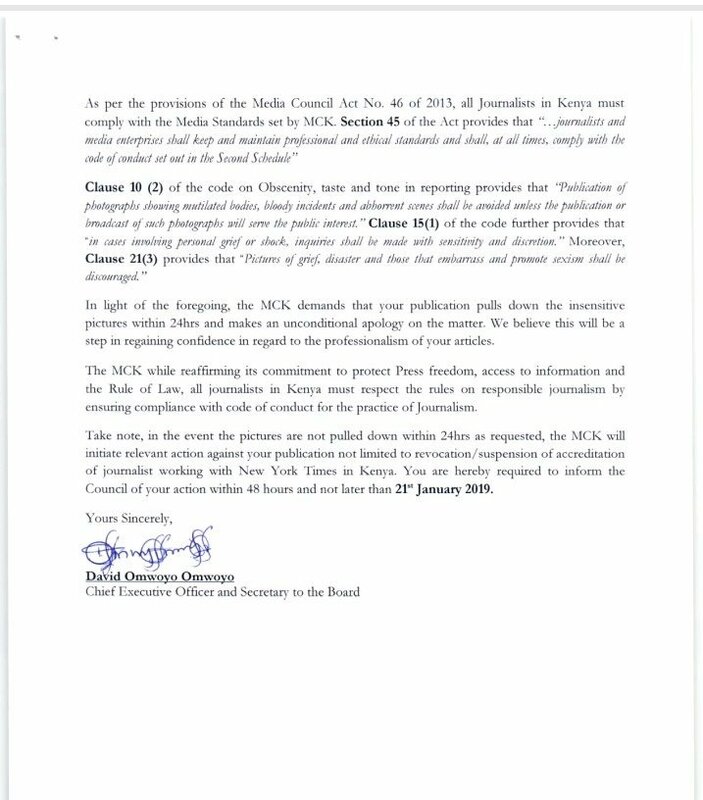 “Take note, in the event the images are not pulled down within 24 hours as requested, MCK will initiate relevant action against your publication not limited to revocation/suspension of accreditation of journalists working with New York Times in Kenya. You are hereby required to inform the council of your action within 48 hours and not later 21st January 2019,” concluded the letter.